So, how effective is Hootsuite as a social media manager? Does it really help you organise your social media posts, updates and analytics? Well, to learn more about this highly popular social media management tool, we decided to try Hootsuite out and share our experiences of using it. So, in this article, we provide you with a detailed review of the features offered by Hootsuite for effective social media management and weigh the pros against the cons. The objective is to help you make an informed decision about whether Hootsuite is appropriate for your social media management requirements. Before we delve into the world of the social media marketing features offered by Hootsuite, let us first take a brief look at the company’s background! To start, the popularity of Hootsuite has reached significant heights by managing to serve more than 10 million users across more than 175 countries. With their headquarter in Vancouver, Canada, they have offices in eight different countries and offer support for the languages of all those countries. While adding these multiple social networking sites, you are asked to enter your corresponding social media site login ids and passwords. It is clearly mentioned that you are authorising Hootsuite to gain access to your information on those specific sites. It even goes to extreme detailed levels for seeking authorisation. 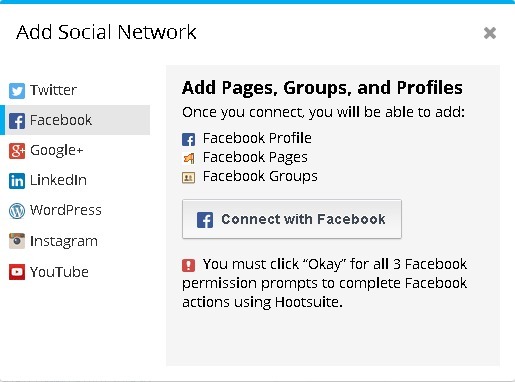 For example, when we gave it access to our personal Facebook account, it asked which business pages, groups and personal profiles we wished to add to the Hootsuite dashboard. The important thing to note here is that every Facebook business page or group that you add for integration with the dashboard is counted as a social profile. And, you can only add three social profiles with the free account. 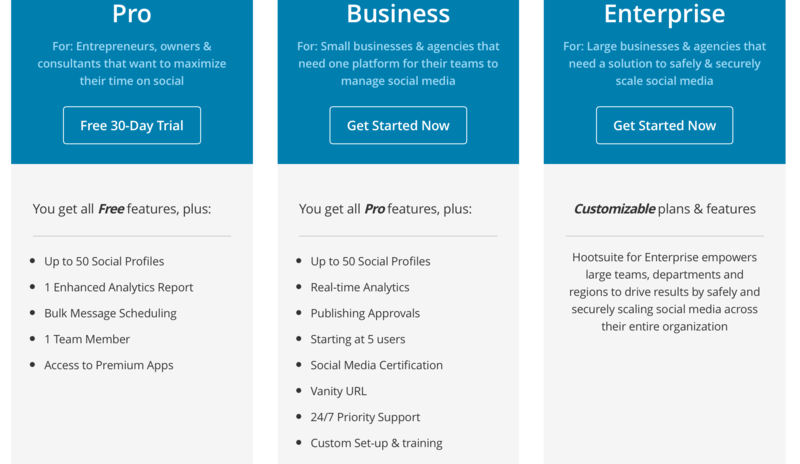 In order to manage more social media profiles (100 to be precise), you can upgrade to the Hootsuite Pro account for businesses at any time. 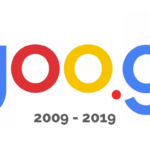 Moreover, we wanted to add our Google+ profile to it, but Google does not allow personal Google+ profiles to be managed outside and we could only add Google+ business pages for management from outside. Now, even though the Hootsuite dashboard gives you the liberty to manage multiple social media profiles from a single place, it does so without requiring you to log in to each social media site. 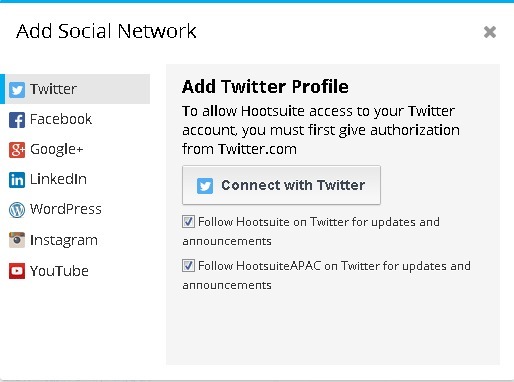 In short, you are not expected to reveal or share your password for different social networking sites with the Hootsuite dashboard. Once you have successfully registered for a Hootsuite account, they send you an email with various options for you to get used to the features of Hootsuite and its dashboard. 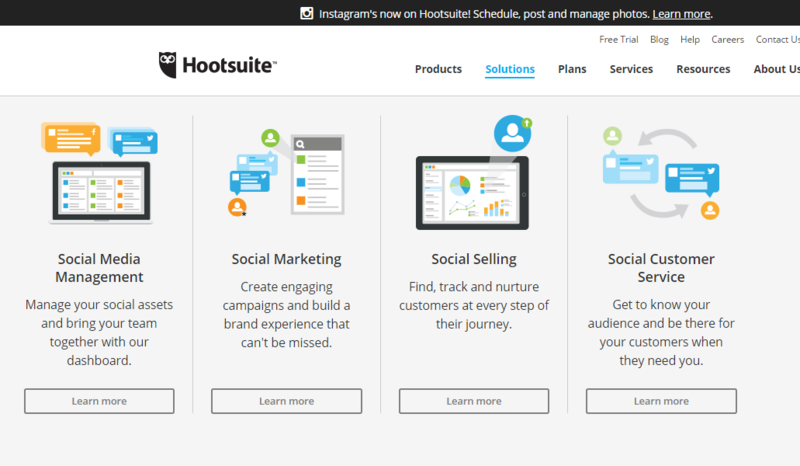 For example, you get a link to the Get Started with Hootsuite for Free page that shares some basic knowledge about how to set up and use the dashboard and the overall tool’s features. Additionally, you can access Hootsuite Podium to go through some free online social media courses to develop better social media management skills and drive your career. You can even learn the fundamentals of social media marketing with their six free online courses and then get certified with a social media marketing certification. On the dashboard itself, you get access to “Wise Guide” that shows you how to add a social network, schedule a post, monitor mentions or keywords, find and share content everywhere using Hootlet, and so on. For appropriate answers or resolutions to your queries or issues, you can also browse through the Hootsuite helpdesk at any time. You can also connect with the Hootsuite Facebook page or Twitter page and check out fruitful discussions in the Hootsuite forum (“Ask the Community” section). At first, the Hootsuite dashboard may look a little complicated. But, once you start browsing around and taking a look at what it offers, you will realise that most of the features are self-explanatory. Alternatively, you can even change this refresh setting and keep the “manual refresh” active. This means that you will get updates about posts, likes, comments and so on your social media profile at the frequency of your liking. Moreover, you can add the social networks that you want to be managed from the dashboard itself by using the “Add Social Network” button. 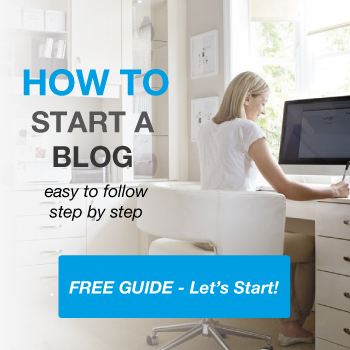 It is even possible to add your WordPress blog with the free account. 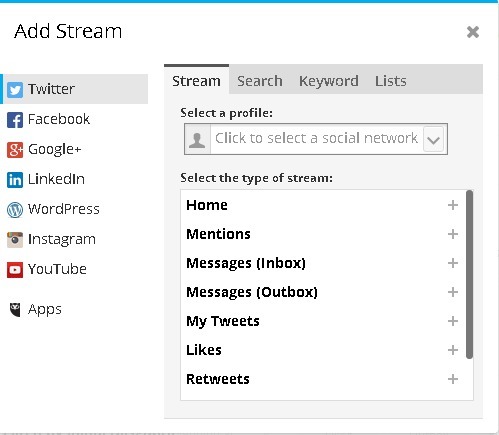 From the social networks chosen on the dashboard, you can then opt to view the associated streams by adding the stream views. For example, you can add and view streams like events, pages, scheduled messages or your timeline for your Facebook profile. Similarly, for your LinkedIn profile, these streams appear in the form of the LinkedIn home page, your own updates on LinkedIn and any scheduled posts or messages. Once you have set up your choice of social networks and the relevant streams, you can use the Hootsuite tool to compose messages that you want to post. Simply hover your mouse over the top left side of your dashboard to get the option to select your social media profile on the left, with the section to compose a corresponding message on the right. In the message, you can add your choice of text and attach media files in the form of photos or videos. 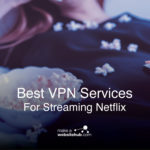 In fact, you can even connect to your YouTube channel to upload new videos and share them with all your social networking profiles. 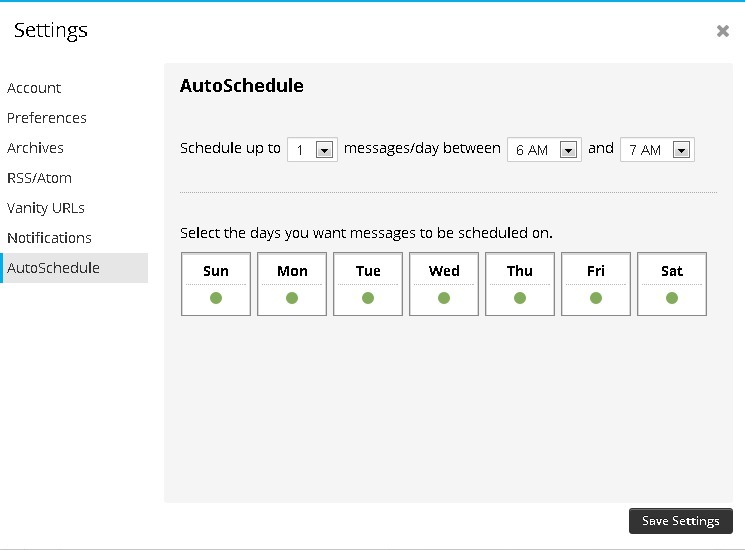 You can either choose to schedule the exact date and time when your message should be posted to all the selected social media profiles or you can activate the “auto-scheduler” option. This lets Hootsuite determine the time when your messages are posted for optimal impact and better reader engagement, based on their experience. For these messages, you can even add your location by allowing Hootsuite to know your location of posting. Moreover, the “Targeting options” enables you to select only your Twitter profile to target your audience by country. This is useful when you want to share some tweets to readers from a specific demographic. And, the “Privacy options” is only applicable to your Facebook, Google+ and LinkedIn profiles. This feature gives you the ability to decide who views your posts and updates. You can even add links to your messages. These site links or URLs can be shortened, with URL shorteners like ow.ly, owl.li, ht.ly or htl.li. Once you have written your message with all the settings and attachments, you can choose to send it immediately or save as a draft. A message draft can be viewed and modified later until the actual time of posting arrives. In addition, you can use the “Publisher” section to get extreme details about the scheduled posts, drafts and messages that have passed the scheduled date or time, had required approvals, had expired approvals and had been rejected. If you possess an RSS feed, you can even use this platform to feed them all to the social networking profiles. With the free account, this type of auto posting is allowed for up to two profiles. In the “Publisher” section, you even get access to the bulk message upload feature, which, unfortunately, is not available with the free account. 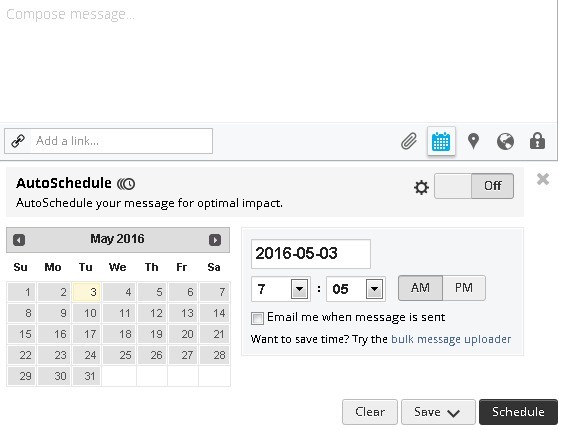 We used this feature when we later upgraded to the Hootsuite Pro account. We were even able to auto post (via RSS feeds) to more than two profiles. 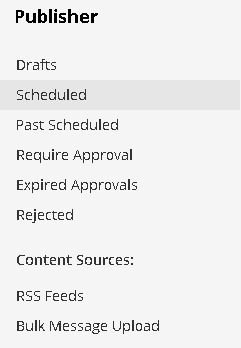 This publisher tab makes social media post scheduling a piece of cake. And, the Vanity URL feature allows you to use your own domain name for shortened URLs, thereby creating a better brand recall value for your business or clients’ businesses. You can also check out detailed analytics reports for your social networking profiles in the form of Twitter engagement (detailed), Google Analytics, Twitter Aggregate, Facebook Aggregate, Facebook Insights, ow.ly (URL shortener) click statistics and more. You can even build your detailed reports from over 30 modules to share them with other Hootsuite users as well. The Pro account also offers a highly effective collaboration functionality that allows multiple people to manage different profiles from the same Hootsuite account. This is especially useful for social media agencies and businesses that manage multiple social networking accounts by delegating the responsibilities of each profile to different people. Thus, working in a group is extremely easy, while using the Hootsuite social media tool. If you have a team working on the Hootsuite dashboard, you can assign different streams and different messages to the team members. The “Assignment” section enables them to check the messages assigned to them or to assign messages to others. You can even leverage the maximum benefits of the Hootsuite campaigns section which is aimed at the better engagement of your social media audiences. You can sign up for free and then publish sweepstakes. However, for creating contests (photo contests, video contests, Twitter contests or Instagram contests) and for user-generated social galleries (Instagram and Twitter galleries), you need to upgrade to the Campaigns Pro plan. This functionality is currently available under the Beta version. With the app directory, you can also avail the amazing features offered by some quality apps, such as SoundCloud, Google Drive and Salesforce. For example, Salesforce allows you to interact with your customers through the Hootsuite platform. 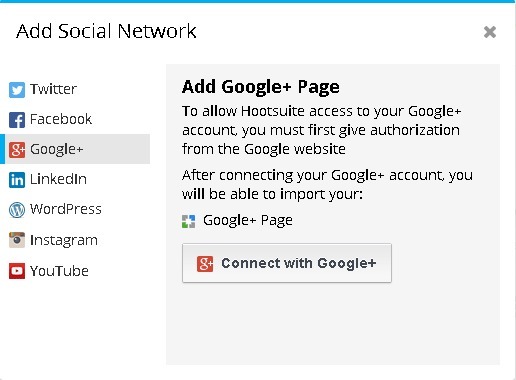 There is no need to download Hootsuite, as it is a web-based tool. It offers a free plan as well as a 30-days free trial period for the Hootsuite Pro plan which allows you to try out the various features and get used to the ways of working with this tool. Hootsuite mobile apps for iOS and Android are available. It gives you access to a massive library of apps (from its app directory) that enables you to significantly improve your social media marketing and management prowess. 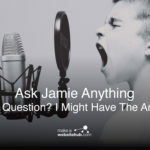 It is one of only a few social media marketing tools that support the management of multiple YouTube accounts from the dashboard, along with the ability to schedule video posts to your social networking profiles. You can even use the custom search stream to find relevant videos for posting. It gives you the ability to learn social media management and marketing with the free online courses and get certification. It gives you the ability to compose messages and post them to any social media profile from any page or tab on the Hootsuite dashboard. It gives you the option to add the RSS feed of your blog, coupled with the auto-sharing of your latest blog posts. With Hootlet (a free add-on for Chrome), you can easily post content to your social networks from anywhere on the web. If you do not have any content to post, the tool makes suitable recommendations that you can read to make relevant posts. 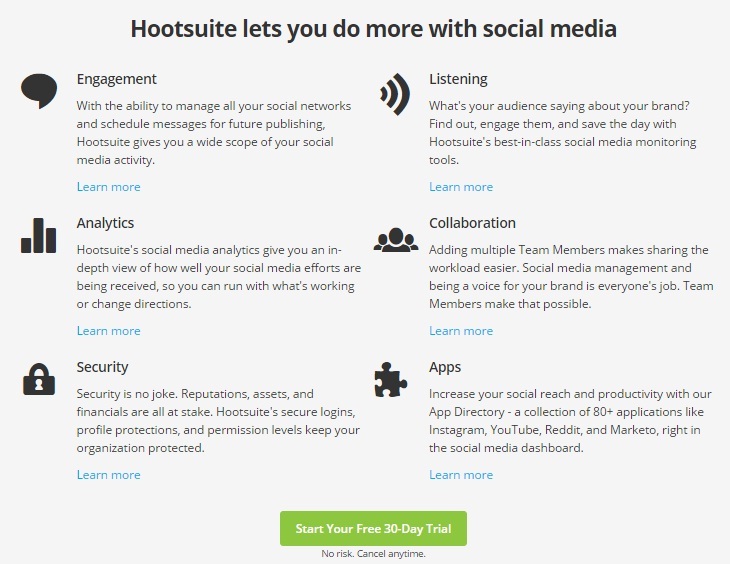 The Hootsuite free plan only allows you to manage three social media profiles. If you want to manage more profiles, you have to go for their paid or premium plans (starting with the Pro account). The initial appearance of the Hootsuite dashboard may appear confusing and intimidating for newbies. It only supports a limited number of URL shorteners (ow.ly, owl.li, ht.ly or htl.li) for adding links to your messages. Adding more users than is allowed to access Hootsuite can prove to be very expensive. The Verdict – Do we recommend Hootsuite? In short, No we don’t. I’d like to say that the pros of Hootsuite outweigh its cons, but in reality it doesn’t. There are many benefits that you can leverage from Hootsuite for the effective management of your social networking accounts or profiles, but there’s better Hootsuite Alternatives out there that you should take time to investigate. The fact that Hootsuite offers flexible plans that even enable you to try out the features for free and then slowly upgrade to higher plans, as per your requirements, makes it a hot favourite among most of the highly popular social network management tools, but over all it’s very expensive for what you get, considering that there’s platforms like Sendible offering the same things plus additional and innovative functionality for a lot less per month! Have you already used Hootsuite for your social media sites? If so, please share your valuable experiences below. How to Get More Followers & Likes on Instagram – FAST! Hootsuite isn’t that bad when it comes to pricing. I mean, ok it’s a bit more expensive than its competition, but well worth the investment when you see what you’re getting in return. I hear your point, but I think they are falling behind services such as Sendible. I’ve used hootsuite for one year. They almost doubled prices on me, send me hundreds of useless emails, and constantly try to sell me upgrades or additions that will “make life easier”. 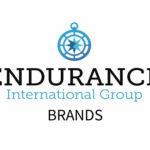 I am learning social media management so I have 3 different groups I post for. One is on trade, one I do for free because they are a small non-profit, and one is my own start up business. To add all those accounts (for which I get paid nothing) is $100 per month. That’s very excessive for something not as helpful as I’d hoped it would be. Hey Jessica – you might want to take a look at Sendible – I’ve moved to them recently and so far enjoying their UI and tools. Sometimes, some of these social media managers don’t really work as advertised. Just so you know, the prices have gone up a notch. Hootsuite in particular has taken their pricing up to $99 just for the basic plan, and they can’t stop sending emails. Phew! 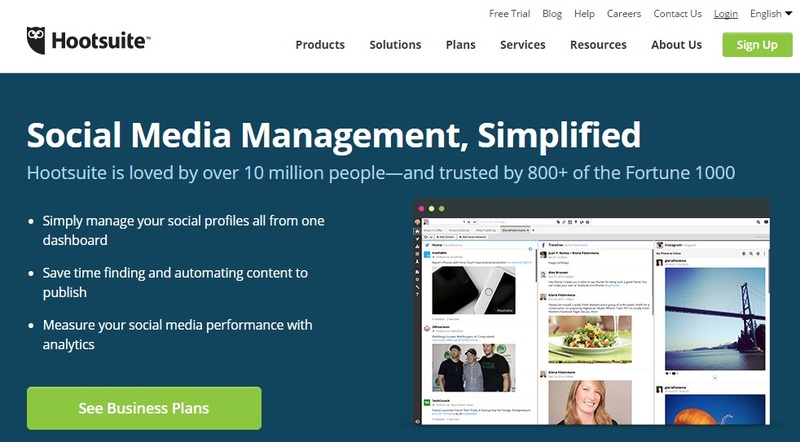 Does Hootsuite integrate with CRM Bitrix24 ?